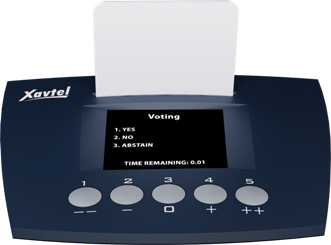 The VOTEPAD-AT/DR comes with five buttons for voting or rating, a LCD screen for displaying the real-time voting result and information such as voting instruction and voting time (count down). The voting can also be conducted as a public voting or a secret voting configured by Senator Designer software. The VOTEPAD-AT/DR provides the integration with a RFID card reader for attendee sign-in function and identification. The votepad has two type of models, which differs from the connection. The VOTEPAD-AT connects to the CDM1000 microphone unit, and VOTEPAD-DR connects directly to the DDB104 microphone junction box, the VOTEPAD-DR direct connection to the CDM-Net Loop provides a cost-effective solution for conference which requires voting facilities. The VOTEPAD-DR will be shipped with a 2.5m microphone cable, which will be connected to the mini XLR connector on the rear side of the VOTEPAD-DR and directly to the DDB104 Mic Junction Box. The Votepad-AT will be shipped with a 3.5 mm male phone jack cable, which will be connected (attached) to the CDM1000 microphone.